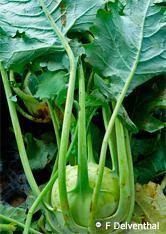 Kohlrabi is a member of the Brassica (cabbage) family that is not well known to home gardeners. This family’s crops are normally grown as winter vegetables and Kohlrabi can certainly be grown in the winter and it does get sweeter after the first frost. However it can also be successfully planted in the spring and enjoyed all summer. The edible portion of the plant is the swollen globe of the stem, which grows just above the soil surface. The leaves, which grow from the swollen globe, are also edible. This globe-shaped veggie is sweeter and milder than either the cabbage or turnip. It is also very nutritious and a great source of fiber, vitamins A and C and the B-complex group. Its blue green leaves set it off and make it an eye catcher in the garden. This plant requires full sun, plenty of water and well-drained and fertile soil that is high in organic matter. If your soil is lacking in nutrients for good plant growth you should foliar feed with fish emulsion every other week and also side dress with compost or manure, if you have some or know of a good source. To get sweet and crisp globes the plant will require about an inch of water per week. Mulching will also help to retain moisture around the plants plus keeping the roots cool. You can look for starts in the nurseries in late April for May planting. I like to get them into the ground by May 15th. When transplanting seedlings you should plant them just below the set of leaves, as this is where the globe will begin to swell. You can also sow the seeds directly into the ground but this will delay the time it takes for the globe to mature and your enjoyment of that first sweet and succulent Kohlrabi. The harvest begins when the globes are from one and a half to three inches in diameter. Cut off the globe about an inch below the bulb. Remove all of the leaves and then peel off the outer fibrous layer. Now you can eat it as one would an apple or cut it up into sections. It can also be grated into a salad, steamed, sautéed, roasted, or added to a stir-fry. The leaves make a good substitute for spinach, either in a salad or cooked. This is one of the few vegetables where the entire plant can be eaten. If only for that last reason, you should consider growing this delicious globe, the Kohlrabi!